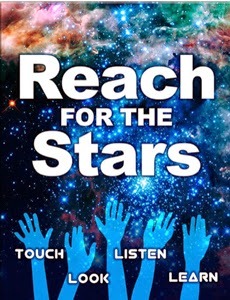 Reach For the Stars is an interactive book which is available on iBook and that includes interviews in which scientists from NASA and ESA speak directly to young students. It includes graphs and visuals (e.g., the Hertzsprung-Russell diagram, the electromagnetic spectrum) that kids can both look at and listen to, striking images from the Hubble Space Telescope, interactive questions, a glossary of over 100 terms, and much more. Students explore the fundamentals of astronomy, the latest scientific advances, the tools that make those advances possible, and careers in science. They’ll discover how the universe began, how different kinds of stars are born, and how those stars change over the course of their lives. And they’ll take a closer look at the Tarantula Nebula, the largest and most intense region of star formation in the Local Group of galaxies. Reach for the Stars is the perfect resource to expose all students—including those with visual impairments and other print disabilities—to critical STEM content.